Writing in Time magazine, Bill Tancer from Hitwise has given insight into Twitter user profile data. There are a number of systems that allow analysis of what Twitter users are posting, but it is much harder to analyse who they are. I have previously discussed statistics showing Twitter's global reach and was interested to see the Twitter demoographic information that Bill Tancer and Hitwise found. 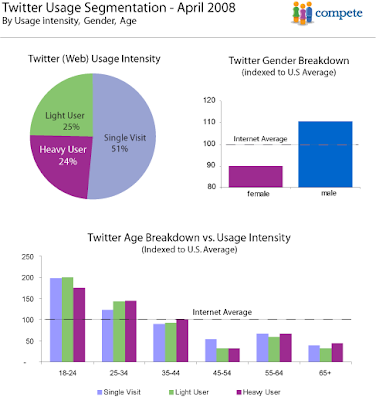 - Twitter's largest age demographic is 35-to-44-year-olds who make up 25.9% of its users. - 14.7% of Twitter visitors are type H03 a.k.a the "Stable Career," comprising a "collection of young and ethnically diverse singles living in big-city metros like Los Angeles, Philadelphia and Miami." The Stable Career tends to work in the arts and entertainment industry, drive small cars and espouse very liberal political views. - 12.3% of Twitter's visitors are H01 a.k.a. the "Young Cosmopolitan," 40-somethings likely to drive a Prius, earn household incomes over $250,000 per year and also identify with very liberal politics. So Twitter is no longer dominated by the 18-24 age group, according to Hitwise, middle aged men are now the key drivers! This may be in line with Twitter moving from being a 'my cats been sick' status reporter, to being used more as a distribution network and feed reader? There is therefore an interesting disagreement in Twitter user profile data findings between Compete and Hitwise. I guess the different methodologies and the fact that Compete data was produced 6 months ago will have something to do with the variances? Either way the key take out is that Twitter is not just 18-24 year olds using the service as an SMS substitute. Older, professional (male) audiences are key Twitter user demographics too! I strongly doubt that middle aged males are the ones most likely taking up twitter. I think Hitwise's data is skewed because they monitor the internet activity of the account holder, not necessarily the individuals within the households. I think the key thing is that Hitwise etc don't get stats on all Twitter use, they only pick up people who directly access Twitter through the Twitter website. Since learning about this I guess you can take all of the figures reported here with a large pinch of salt! Not only middle aged, youngsters are also the big user of twitter.